Our companion parish, St. Mary's, Bainbridge, is a small urban parish struggling to maintain membership. Located off South Street in Philadelphia, St. Mary's established a soup kitchen in 1982 which today serves soup and sandwiches to over 100 homeless and unemployed adults and their families every Saturday. 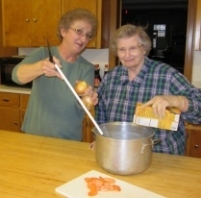 St. James' provides help with the soup kitchen on the third Saturday of the month. Participants gather in the parking lot of St. James at 9:15 AM to carpool to St. Mary's. Soup is prepared in the St. James' kitchen on the Thursday prior at 9:00 AM. Cookies, which are baked by many St. James' parishioners, are also taken along to distribute after the meal. Cookies should be left in the kitchen labeled St. Mary's. If you are interested in assisting at the soup kitchen or with soup preparation, please arrive at St. James' at the times indicated.